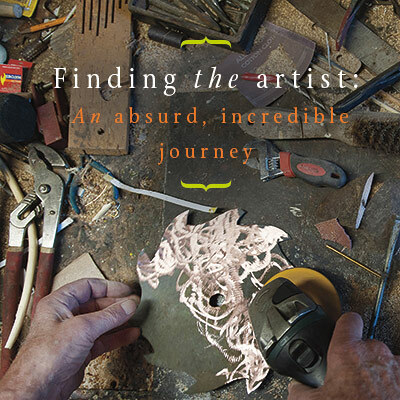 There’s a trick to finding the artist. It involves a trek down a private drive at the back of a nondescript neighborhood north of Spokane. A patch of pavement gives way to dirt and winds to a tree-shrouded valley. Just as worry sets in that this is the wrong way, a peculiar wooden sculpture pops into view. Then two more towering abstract monuments pose by a bridge into this magical place where art sprouts from the lawn. Harold Balazs is on the porch of his rustic house, a retreat lovingly furnished with art and photographs of family and friends. He invites me in, where his wife Rosemary is clearing away breakfast. These days Balazs (pronounced Blaze) fills his mornings with paint. 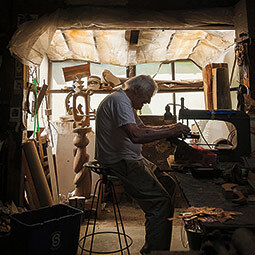 The 86-year-old perches at a massive wood table, which he built years ago, and holds court over acrylics, brushes, and papers. 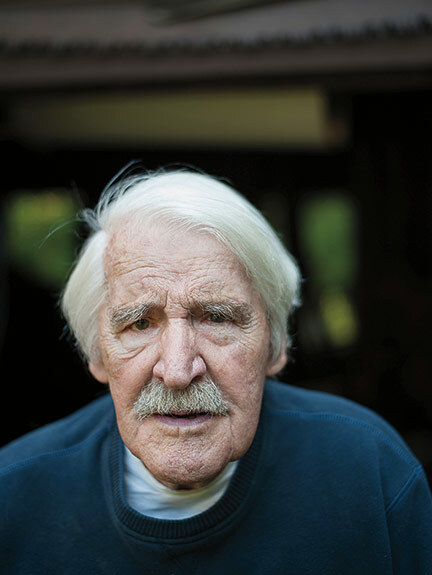 A degenerative disorder has compromised his balance, played havoc with his movements, and affected his ability to find the right words and fully express himself. He is frustrated he cannot always do the welding and sculpting he loves, but it is not keeping him from creating more art. 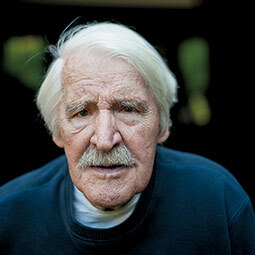 Today, though, he pushes his paints aside, and with his words and gestures renders his story. 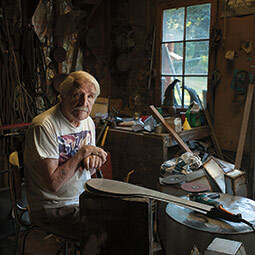 He stepped onto the Northwest art scene in the 1950s with his painting, welding, enameling, and concrete artwork. Known for his collaboration with architects, particularly on liturgical commissions, he easily shifts shapes and styles to suit his projects. But with 65 highly productive years as a professional artist, there is still much more to tell. And, as with Balazs himself, there is a trick to finding his creations. Though he is one of the most prolific public artists in the Northwest, we have lived with his works for so long, we may not even recognize them. His touch is in the molded brickwork of a bank tower on Spokane’s Second Street. It is in the doors and altars of churches all around the Northwest. And his art is in, yes IN, the Spokane River, a rippling stainless steel sculpture floating on the water. Once you start looking, you find Balazs everywhere. In Pullman, a dense tangle of concrete puzzle pieces borders the courtyard of the Museum of Art at Washington State University. A short walk away, an up-pointing arrow perches in the entryway of the Terrell Library. A few minutes east, a colorful abstract mural enlivens the alumni center. And you can find more, if you look. Even the curators at the art museum missed the massive, undulating bas relief panels between the first and second floors of Streit-Perham Hall and had not realized or remembered that the three-sided wood and concrete tower in front of the Presbyterian church on Stadium Way was classic Balazs. Pick any sizeable city in the Northwest. It likely holds the artist’s paintings, abstract metal monuments, gravity-defying concrete works, rippling walls of wood, and shiny enamel murals glowing with forms and flowers and birds. “I remember him storming out of Spokane in the fifties or sixties, a volcano of energy spewing fresh Balazian sculpture in every direction,” noted Fred Bassetti, one of Seattle’s most influential architects. 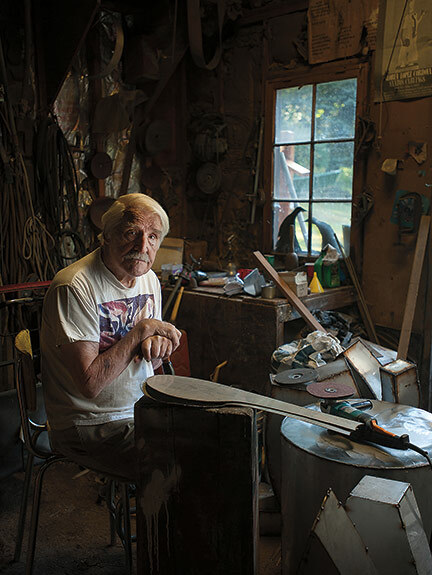 Balazs first bent a piece of metal to his whim in Westlake, Ohio, a village about 12 miles outside of Cleveland. His father Harold was a sheet-metal worker and air-conditioning repairman. 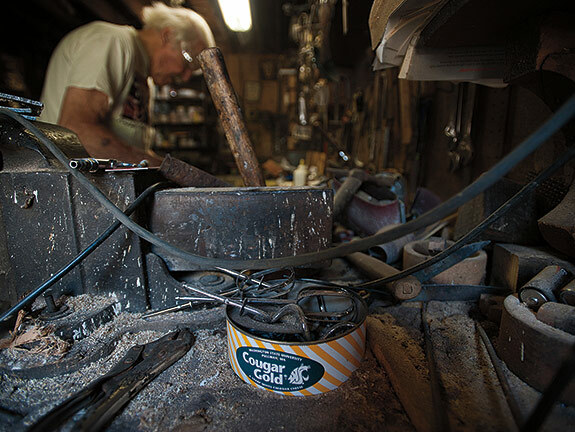 In a shop at the back of the farmhouse, he taught his son the skills of bricolage and metalwork that would serve as scaffolding for a career in the arts. 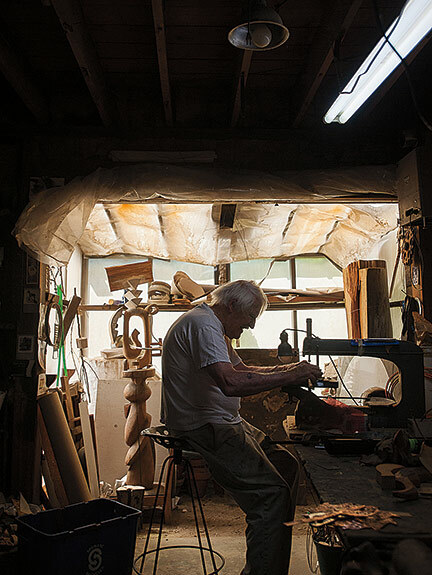 A consummate craftsman, Harold senior honed in his son a meticulous attention to detail as well as the habit of making do with the materials on hand. After high school, Balazs strayed into mathematics and engineering at a junior college in Chicago, thinking, because he liked drawing airplanes as a child, he might go into aeronautics. But “I wasted a year,” he says, though the time in Chicago gave him a taste of life drawing and anatomy classes. 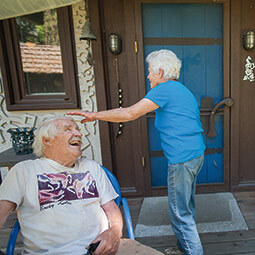 When his family moved to Spokane in the late 1940s, he happily moved, too, and enrolled as an arts major at Washington State College. Somehow among his myriad activities and classes, the art student from Ohio found time for love. He met a sparkling 17-year-old Rosemary Schneider at a Spokane swimming pool one summer day in 1947. She was nice looking, he says, smiling across the room at her. She rolls her eyes before heading out to the garden to leave us to our interview. 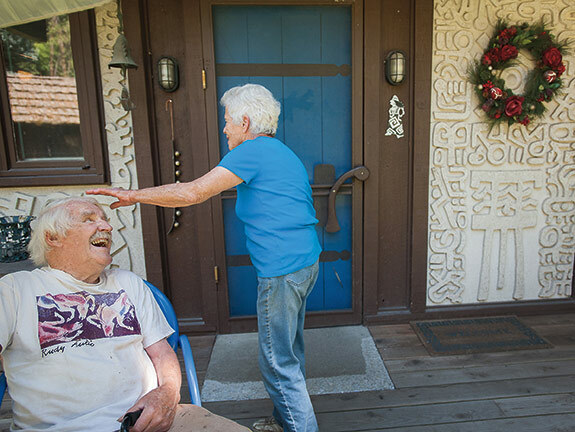 Harold and Rosemary married in September of 1950 and moved into a $12-a-month shack in Pullman. It had a little wood stove and old-fashioned ice box, which Balazs would chill with icicles he plucked from the eaves of fraternity houses. “Here I am this young jerk with a beautiful wife and then next thing you know, we’re waiting for a child.” Kurt arrived just a week after graduation. 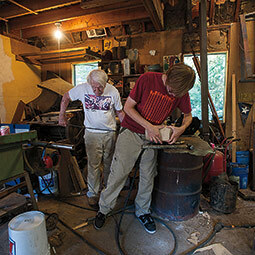 The young family moved in with Rosemary’s parents in Spokane and set up a workshop in the basement. Rosemary would help with the metal and enamel jewelry, cut stencils, stock supplies, and make deliveries. They sold pieces through shops in Spokane, Seattle, and Portland. The smaller items, which today command as much as $400 on Etsy and eBay, then wholesaled for just $8 or $9. At the same time, Balazs was entering juried competitions and developing a following. A Spokane newspaper covered his one-man exhibit in 1954. “Balazs’ work is characterized generally by a gay sense of color and lively humor,” wrote Gladys E. Guilbert for The Spokesman-Review. The article notes that his paintings had been accepted for exhibition at the Seattle Art Museum and the Henry Gallery Invitational, and had won a major Henry award. The one-man show in Spokane included paintings, mobiles, enamel plaques, lithographs, earrings, cigarette boxes, and pictures done in lacquer and metal. In spite of his critical acclaim, Balazs was repulsed by the business of “Art.” He found the gallery scene of cultivating collectors and schmoozing with dealers distasteful. “I found the more money, the more scoundrels show up,” he says. So he focused on creating pieces more people could afford, working directly with clients, and producing major works for mere dollars. In 1965 the Spokane Airport Board, for example, paid him just $800 for a sculpture he suspended from the ceiling. Across a wide lawn and opposite their house, the Balazs family built a barn to serve as a studio. They named it Mead Art Works and welcomed the helping hands of many “Mead Workshop Elves.” Rosemary was the most essential collaborator, “without her none of this would happen,” says Balazs. But his father would also do metal work, his friends would assist on the larger pieces, and younger artists who lovingly called him “Uncle Harold” would trade their labor for his mentoring. The children would take part, too. 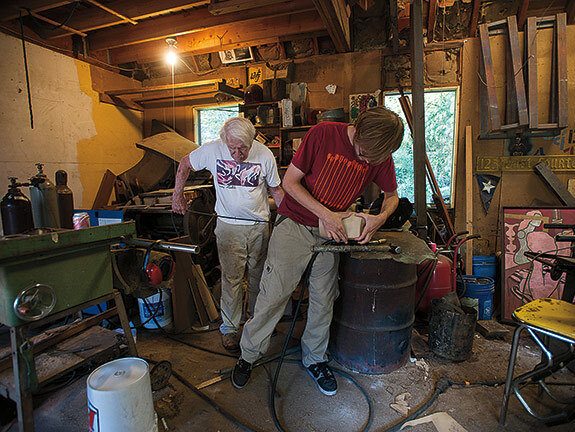 Lately Balazs’s grandson Keegan has picked up the welding torch when the artist’s physical state cannot keep pace with his imagination. 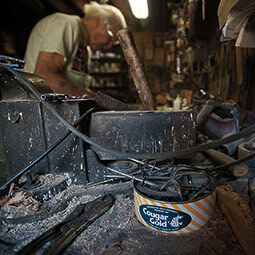 Seattle architect Tom Kundig, who visited Balazs’s workshop as a child in the 1960s, started helping as a teen. “Harold had unstoppable energy,” says Kundig. “He was always thinking about the world, what was around us in culture, in nature. He would take all of that and then turn it into art. A flood of art. “Even when his family was watching TV, or if he had a book, he would be sketching, imagining, developing an idea,” he says. “I was once known as the Madman of Mount Spokane,” says Balazs, who counts skiing, along with fishing and hunting, among his favorite pursuits. “I can’t ski anymore, but I once had a controlled ricochet technique that was really something.” The younger architects in town skied as well. “And we shared a liking for modernism,” says Balazs. Those mountaintop encounters led to friendships, which lead to commissions. Willing to create in nearly any medium, and being affordable and a willing collaborator, Balazs became an artist for the architects. The late fifties and sixties brought a boom of church construction. And Balazs had developed a technique with cast concrete that suited it well. He could create baptismal fonts and candle sticks. He used it to build walls at Spokane Unitarian and window grills at Bethlehem Lutheran depicting Christ’s life. Always seeking new challenges, he changed media at St. Charles Parish in Spokane and built brightly hued baked enamel on copper doors, torch-cut iron baptistery gates, a torch-cut crucifix, and a torch-cut grillwork altar depicting saints. With affection, Balazs calls these houses of worship “god boxes.” A secular humanist, he nonetheless researched each commission to create works that would suit and serve each congregation’s values. In the midst of his church commissions, the Puget Sound-area architects discovered Balazs. In Seattle, his first major public work was a 21-foot copper Totem to stand in the plaza of the 1959 Norton Building downtown. Then Fred Bassetti commissioned a copper sculpture for the front of the Henry M. Jackson Federal Building. And Tacoma’s Robert Price called, as well as more than 20 others. Balazs liked being in on it from the start. Whether it was a gate, a sculpture, or a simple embellishment on a wall, he sought to craft the things that would elevate the projects. By the 1970s, more than 80 percent of the Balazs’s income came from architectural commissions. Playing with brick, metal, and concrete, developing new techniques, it was all part of the fun, he says. He could carve enormous polystyrene forms for walls, gates, and sculpture, fill the crannies with concrete, and reinforce the pieces with rebar. The results were ornate forms, both abstract and representational, but always intriguing. But his greatest challenge was the 32-foot “lantern” made with 20 concrete panels. It was the largest object of art planned for the fair. Creating the design and building the form went well, but assembling the piece onsite, which Balazs always did himself, and without safety equipment, turned treacherous. “It was a very windy day and I was right up at the top,” he says. “The wind caught a piece and I tried to restrain it, pushing it away from the building.” He was pinned and crushed three vertebrae, the worst injury of his career. The incident laid him up for several frustrating months. But he turned his convalescence into an opportunity to focus on watercolor landscapes. Once recovered, he was all the more driven. Balazs likes to paraphrase philosopher Alan Watts: “You’ve got to be part rascal.” Watts believed the secret of life was to be completely engaged with the task at hand, and to realize that it’s not work, but play. That suits Balazs who is driven to play every day. “It beats honest work,” he says. As our morning draws to a close, Balazs invites me to see the works he has collected from his friends. Every wall of the home is covered, and sculptures linger in the corners. He points out a large, and now quite valuable, Autio piece, proud of his classmate’s success. And then he brings out a stack of his own paintings that he has completed for a summer show at The Art Spirit Gallery in Coeur d’Alene. What he does care about is the color, the surprise, the response his bright creations of shapes and signs might provoke. Balazs doesn’t know how many works he has created, or where they might be. He has produced many thousands of things and never kept a catalog. A number have surrendered to the weather. Others were vandalized or simply removed because of changes to a site. The Norton Building Totem vanished during a site renovation. “I fear it was sold for scrap,” says Balazs. A bronze lady on a bicycle was stolen from Coeur d’Alene. A Sacajawea sculpture disappeared from Cheney. In Sitka, Alaska, a copper sculpture in front of the city-state building simply went missing. Someone found it at the dump. “A lot of public art ends up that way,” says Balazs, with a shrug. The person who found the piece gave it to a neighbor. When it was rediscovered, the city asked for its return. The neighbor refused. Balazs backed her up.